BMW Malaysia has introduced the MINI Paceman in the country – the three-door coupé interpretation of the Countryman arrives in a single variant guise, that of the Cooper S.
The Paceman, which was announced in early 2011, is the seventh model in the MINI family, joining the Hatch, Clubman, Convertible, Countryman, Coupé and Roadster in the current lineup. It shares the same platform as the Countryman, measuring in at 4,115mm long in the case of the Cooper S Paceman. The Cooper S Paceman is powered by a 1.6 litre twin-scroll turbo mill offering 184 hp at 5,500 rpm and 240 Nm between 1,600 and 5,000 rpm, mated to a six-speed automatic transmission. The box on the ALL4 system hasn’t been marked, so the variant we’re getting is two-wheel drive. The four-seater – which is the only member of the family to be identified by a rear nameplate – features an interior that has been designed specifically for it, with the highlight being an innovative rear seat, styled around a lounge concept and featuring two individual chairs offering generous levels of head, shoulder and knee room as well as outstanding comfort and support. No leather interior, unlike that seen in the vehicles during the international media test drive for the car; the seats in the Malaysian cars are clad in patterned fabric. Cargo space is 330 litres, expanding to a maximum 1,080 litres with the rear seats folded. As for wheels, the local Paceman is clad with 19-inch units (wrapped with 225/40 series rubbers), upsized from the standard 16- and 17-inch wheels in Europe. The ubiquitous MINI interior features some new design cues – fresh deco trim goes on, as are redesigned air vent surrounds and a new placement on the door trim panel for the window toggle switch buttons. The car exclusively features a full range of MINI Connected features, with Radio MINI Visual Boost and a 6.5-inch LCD display as standard fitment. Functions in MINI Connected include Mission Control, which provides information gained from the vehicle sensors. There’s also Dynamic Music, which offers the driver a suitable soundtrack (from up to 10 music tracks) in relation to the driving style, raunchier when pushed and more laidback when ambling along, that sort of thing. For Malaysia, five exterior paint shades are available, including the new Brilliant Copper and a striking Starlight Blue, previously unseen and unique to the Paceman. The roof and exterior mirror caps can be specified in body colour, black or white – a glass roof package is available as an option. The MINI Cooper S Paceman is priced at RM288,888 (on-the-road, without insurance), with a MINI Tender Loving Care service package included. The optional electrically-operated glass roof package adds RM7,888 to that. Read our test drive report on the MINI Paceman, and click here for a view of how the Paceman shapes up against the Countryman. The pariah scum company BMw can charge so high but only give 2 years warranty. Everyone else is now giving 5 years. Even Mercedes has upped it to 4 years. You know why BMW still gives 2 years? Because BMW gearbox is known to fail right after the 2nd year warranty expires. Be prepared to cough out RM80k to repalce the gearbox. The same with the Mini. As a cheap toy, Boxster is definitely a better choice. Gold one mehh?! 289k for this thing? 80k also dunwan! “ONLY” RM289?? It’s bloody expensive for a car like this..Just compare it with a golf GTI or even a BMW 320i and you’ll see how ridiculous the price is. But then, it’s a niche market and there’ll always be people who would want to be different.. Anyone with enough brains to afford this car will be able to read that the only word is referring to the availability of the car as a Cooper S only, no Cooper model. Even if it stated RM289k only is not an issue, Sometimes i dont understand why ppl love to bash the price. RM289k only can mean its s final price and no additional option cost to be added. Besides, whoever think its expensive then seriously you are out of the league. Mini is a niche market luxury small car everywhere no matter where you are staying. Hey, Mr Bean will be the first to buy ok…. I think it mean ‘only’ have 1 variant which is cooper s.
This Paceman is the range of RangerRover Evoque and Audi Q3.. May I know competitor price expensive or not? pfffft.. it is way to small to competes with Evoque and Q3..
Why would people choose this over the 328i? Because they already have X6 from BMW and S-class and a few other good vehicles, and they really like this special little car. It is bought to be seen everyday in his garage, not for driving. Nope, for someone who is satisfied with 3-series, he is not yet ready for this toy. one reason only, because 328i is too much on the road. Its really nothing special driving a 3 series nowadays beside yourselves feeling that ‘u have made it’… But this is different, this is niche market where you can be outstanding among the crowd. I couldn’t agree more….with that kind of money I’d rather buy 328i or Audi A4 or XC 60. Plus, is not what you call an attractive car either. I mean, the rear lights reminds me of the eyes from a giant. come on guys, this is rich man toy. i believe they aledi have luxury sedan >500k. this 1 just to fetch d aunty go pasar buy goods. Heads turn, reason A coz it’s too ugly or weird. B coz it’s too pretty but i guess A! Thats d reason my dad bought a recond slk for my mum when he initially wanted the latest 328i. his point is exactly same like urs, he said, 3 series sedan doesnt matter its a new car, its still a 3 series and no one will look. but with SLK top down. damn, it does make ppl’s head turning. Wah…RM290k really beyond many ppl in Bolehland, gotta wait few years maybe can afford the 2nd hand ones.But come to think of it, what the heck RM290k i having many choices ! Actually there are many ppl really can afford RM290k. look at the street nowadays. what irks me the most is that in UK, this car is sold at almost similar price to a 2.4L grand vitara or perhaps my eyes are playing trick on me. Why are people here complaining about prices of luxurious vehicles. Why don’t we complain about prices of luxurious interior designs, diamonds, pictures etc? What about the 6-figure Rolex? Regarding the rolex comment. Technically, luxurious watches is cheaper to own in malaysia than many other countries, if we were to compare it to hong kong or China, cause of the weaker ringgit, but that was 5 to 6 years ago, im not in tune with the market now. BUt as for the car, malaysian always complains that the cars are expensive because we know how much a similarly spec car is sold elsewhere. Not only mini, but all cars in malaysia is expensive compared with our per capita income. if we study carefully. Those items that are sold with open competition in malaysia, the prices are still relatively stable. Take handphone and laptops for example, the prices are so competitive that most of the items are not much different than our neighbours. But cars are totally different. In UK, the basic mini one is seen as a good, trendy slightly upmarket car for univ students. 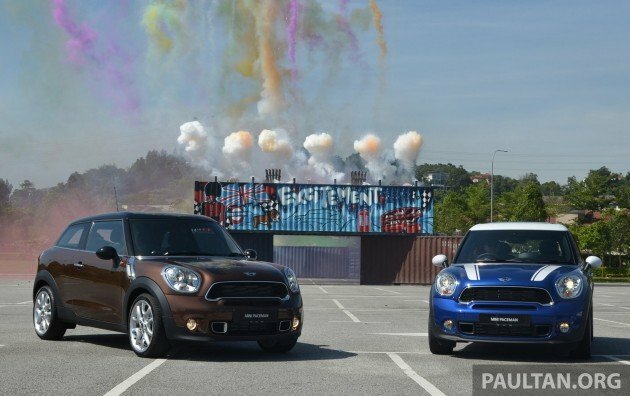 Over in malaysia, a mini one will cost you almost 4 kidneys, 30k each. For this money, I’d love to spend on Ford Focus ST. The new bmw 328i is does not have an excellent engine. Feels rough and the interior has some cheap bits and bobs. Would definately take this over the 328i. Bmw is so common and nobody even bothers anymore. With a paceman, u get heads turning, just like how a Panamera does or an evoque does. take out the E and you have PAC MAN! It was mini cooper… Now it is midget cooper. What happened to cute, small fun? Now it looks like a mini hulk. The design does not look the price. It’s too light headed, simple to be 290K. Id rather get a Beetle 2.0, but then again, the main reason why i would get this if i have that cash is the cute countryman design. 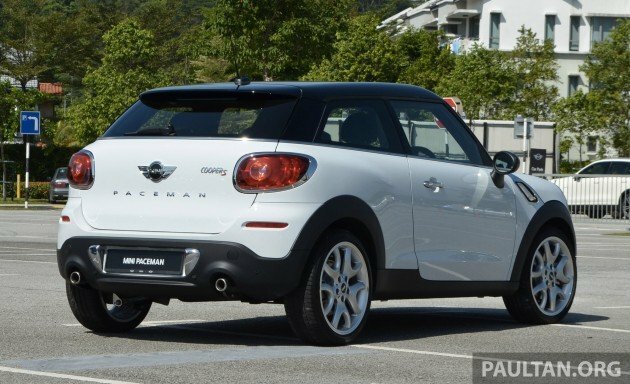 I don”t care about the price what i want is the stylish mini paceman…. If they replace the word ‘MINI’ in the logo with a ‘B’, then it is well worth the price. Next Post: SPYSHOTS: Kia K3 to be named Cerato in Malaysia?